Who do u think was selfish on Legacy Day? hallo guys!! I just wanted to say, I know everything about EAH so I can awnswer any vraag u have, literally anything. so challenge me! favoriete Subject: Magical Meteorology. Learning how to make the perfect snow dag gives me chills! favoriete Subject: Bewitching Song. I love singing with the other princesses at school. favoriete Subject: Environmental Magic. It’s important to learn things like how to properly recycle old potion bottles. Secret Heart's Desire: To live life without limits! There's no beanstalk I can't climb of giant I can't outrun! "Oh Curses!" Moment: Being fearless, sometimes I accidentally get my vrienden into scary situations. favoriete Subject: Grimmnastics. I'm trying to convince the school to introduce hextreme beanstalk climbing to the class. Secret Heart's Desire: To live the single life to the max while I can - and to be gegeven a true heroic deed to do. My "Magic" Touch: I have the most charming smile in all of Ever After! My smile can make any fairytale's dag better. Storybook Romance: Yeah, appel, apple is sweet and we're destined to be an item, but why should the other ladies miss out on a slice of charming? Secret Heart's Desire: To fit in with my new vrienden ... and then rule them ALL! MUHAHAHAHAH!!!! favoriete Subject: History of Evil Spells. I just love reading about the Evil Queen.She's the best, am I right? Least favoriete Subject: Kingdom Management. Shouldn't it be QUEENdom Management? Secret Heart's Desire: After my story ends, I want to open a dance studio and direct my own shows and muziek videos. a comment was made to the poll: If u could have one of the character's names, what would it be? a comment was made to the poll: Who would u rather be best vrienden with? a comment was made to the poll: Do u think appel, appel, apple White is full of herself? a comment was made to the poll: Would u like to learn Riddlish? 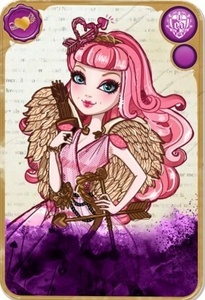 What is the signature colors of C.A Cupid?